I have been training BJJ since early 2002, having received my black belt in 2011. My road of progression in BJJ paralleled that of biology, of which I received my Ph.D in 2007. During this time I was part of a university club, eventually running the club as a blue belt until leaving for the next leg of life and academics in Arizona in 2006. While in graduate school, I progressed with other students (both graduate and undergraduate) of my same rank or just below, and spent many a night out on the town with them as well. When I moved to Arizona to train with Gustavo Dantas, I made even more friends of all walks of life, but somehow it ended up being those students of similar expertise/ belt levels with whom I became closest. We would train in each others garages while pausing and rewinding instructional videos (VHS and DVD), grab bites to eat, and then try to kill each other (kindly) in practice. It was there that I started to see an obligation to be a mentor to lower belts rather than a friend. After receiving my black belt, I moved across the country for a postdoctoral position at a very small liberal arts college in Maine. I would visit local gyms for training, and started a small club on campus with brand-new students. It was at this point that there was a definite instructor/student relationship, as it was both academic AND in BJJ, and, of course, age. I genuinely liked all of my students, but my interactions were mostly limited to training. The next, and current, stage of my journey led me to the heart of America, Lawrence, KS, where I now reside. I run an official GDJJ affiliate school with brown belt business partners and co-instructors Matt and Heidi Thompson and instructor Zak Bucia. We have started to build a strong academy with a shared vision of building a program of inclusivity, trust, and sense of community, no matter the individual goal of the student. 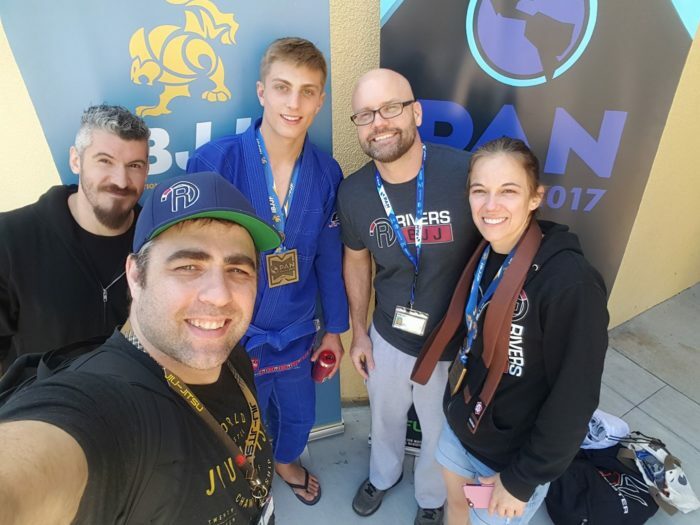 We compete regularly locally as well as at larger tournaments, and have travelled with students to a number of IBJJF competitions, including Pans, Masters Worlds, and Dallas and Chicago Opens. It is here, as an official business with paying students, that I have pondered the instructor/student relationship most deeply, especially with regard to the diversity of students in our school. We have now reached the subject of the title, which boils down to: what is the role of the instructor? How should one interact with students both within and outside of the gym? I’ve had to struggle with this question both in academics and in the dojo, and find that my approach to interacting with students is essentially the same, although the bond is certainly stronger with jiu-jitsu students (more like jiu-jitsu family if I’m honest). I’ve come to the conclusion that, right or wrong, my answer depends on the progression level of the student. I’ve outlined my thought process in some bullet points below that are geared primarily to instructors. Caveat: these are my personal beliefs, and may not necessarily be the best for all gyms/situations. Your school is your business, and you’re a professional, whether you like it or not- act accordingly. Don’t get me wrong- team dinners and get-togethers are great, and I’m all for setting them up or participating in them. After tournaments or promotions, it is common for groups of students to go out to the bars- I’ll sometimes attend but usually leave relatively early and limit consumption for a couple of reasons. First, it’s their time to relax and bond with their peers without their instructor looming about in the background. Second, although I like good beer, wine, and spirits with the best of them, I don’t feel it sets a good example to act even remotely irresponsibly in their presence. This sounds somewhat puritanical, but if I want to tie one on, it’s not going to be with students, or in a place where I might encounter students. I live in constant fear that I run into current or former science students when I’m out, and it happens more than you’d think in a medium-sized city. Your student base is diverse, and you cannot afford to play favorites. We have students on all ends of every spectrum that you can imagine, be it politics, religion, culture, gender, sexual orientation, etc., yet somehow when stepping out on the mats none of that matters. I feel very strongly that it is not our place to proselytize, except of course to join the church of BJJ. This, by proxy, extends to what I post on social media (except for some pro-science stuff, I’ll admit). I, for a long time, considered not even friending students on Facebook, but that just wasn’t logistically possible. That being said, I’m very careful what to post, like, or share on social media. In addition, just think about the tone you’d set if you are always hanging out with a select few students of yours and not others. I’ve got students ranging from 5-50+ years of age, and certainly can relate more to the older ones- however, I don’t actively pursue relationships outside of the gym, no matter how much we have in common. I’m not saying that it’s impossible to do, but one needs to be exceedingly careful to not portray that student as having advantages over others. It’s easier in my opinion to avoid that in the first place. And what happens when a student with whom you are close does something egregious in class, warranting expulsion? There is a division of power between you and your students, as well as your upper vs. lower belts. I will be abundantly clear: I AM NO BETTER AS A PERSON THAN ANYONE ELSE IN MY SCHOOL. However, I AM the instructor, I DO have 15+ years of experience, and I DO have a black belt. The primary reason belts exist is to categorize students into levels that will allow them to have fair and competitive matches when competing or rolling live. Thus, lower belts tend to listen to upper belts when given advice, and there is an unequal power structure when on the mats, which may potentially, and erroneously, bleed over into other situations. When two people aren’t on an even footing and build a friendship, it can be dangerous both on and off the mats. That’s why the military and, to a lesser extent academia, are quite stringent on fraternization between different ranks/levels. I suspect that this is mostly self-correcting as one tends to gravitate towards those with whom you can drill, troubleshoot, etc., who are of similar experience level. However, I would tend to err on the side of caution to not even remotely give the semblance of abusing that power. This brings to the forefront- what if you have high-level, advanced belt students? Is this different? At this point, I would say...it depends, but quite possibly, and even probably. When they are or become peers, things change. Conclusion: I’m friendly with my students, but they’re my students first and foremost. They are more akin to family than friends, with some higher-rank exceptions. I feel I have to try my hardest to be above the fray, available for all students, and not be perceived as playing favorites. I am happy to help students within and outside the gym, and truly enjoy interacting with them at events such as team dinners, get-togethers, etc. However, my primary responsibility is as their instructor, coach, and BJJ mentor, not as their best friend. If I weren’t such an introvert, I might view that as a somewhat lonely position (cliche ‘lonely at the top’), but it suits me fine, allowing me to focus on the progression of all equally.